Arden Surdam, Elephant Ear (2017). Archival inkjet print, 20 x 24 inches. Image courtesy of the artist and Garden. 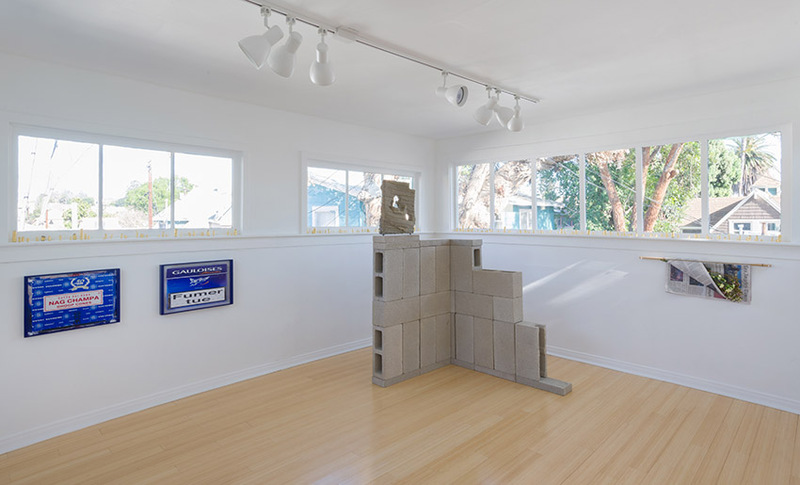 At Garden, an intimate space behind an emerald Victorian in Angelino Heights, a new group show considers the enduring art historical tropes of flora and fauna. Titled after an eponymous 18th century tome of botanical illustrations, A Curious Herbal vacillates from a meditation on mortal decay and preservation (following the tradition of nature morte), to an exploration of plants as mercurial objects that embody both the obscuring and propagating of information (as truth and as allegory). 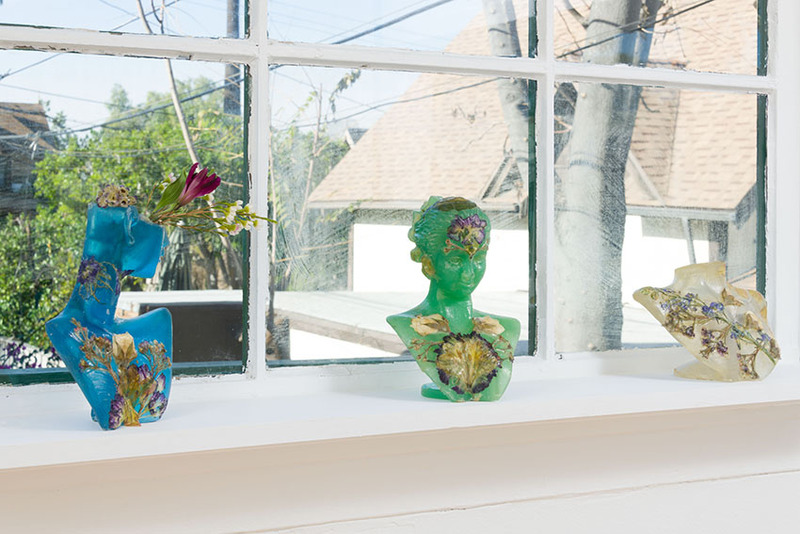 Fossilized tendrils of an ancient sea lily line the gallery’s windowsills, a work by Alice Wang. The ossified remains of this extinct plant have been brazenly dismembered and encrusted with 24k gold-leaf, a gesture that suggests the punishing futility of aesthetic adornment in the face of inevitable mortality. Although opulent, Wang’s gesture is ultimately withholding. Despite augmenting the fossil’s value with a precious metal, she nonetheless suppresses its form and shatters its potential contribution to the scientific archive—but to what end? 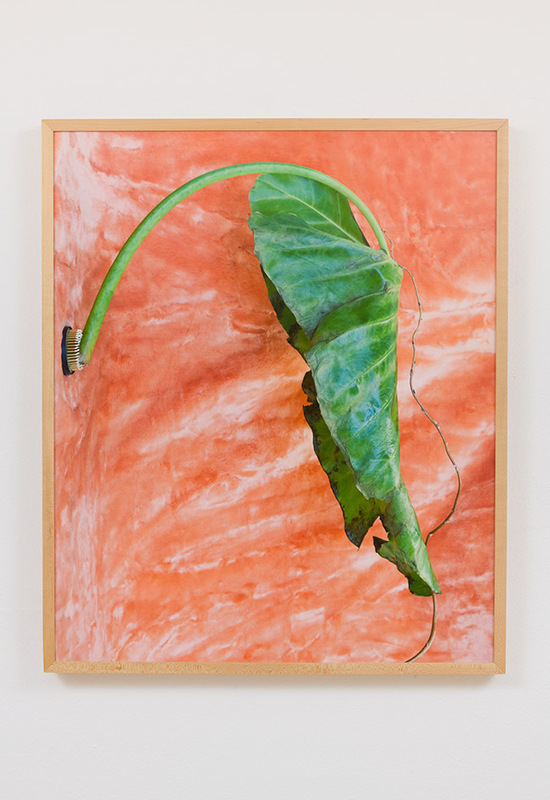 Arden Surdam’s photograph of an elephant ear leaf mounted to a painterly backdrop posits the inkjet print as a vehicle for superficially suspending mortality—visually fossilizing the curvaceous leaf’s slow, ephemeral rot within a two-dimensional plane. 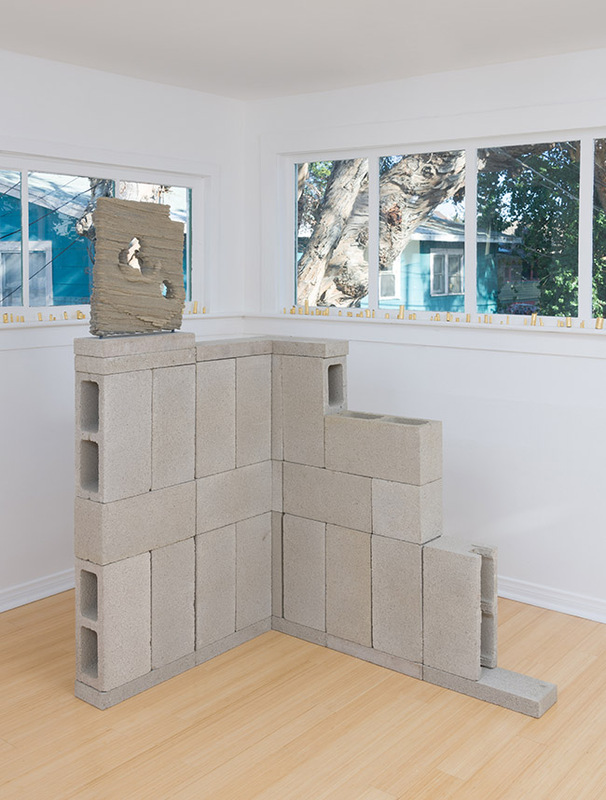 In Dwyer Kilcollin’s transfixing sculptural installation—a totemic resin slab atop a modular cinder block wall—an opposing process occurs. Here, a two-dimensional image of picked fruit has been algorithmically rendered and cast into a static, three-dimensional artifact—an artificially forged fossil that obfuscates its origin. Elsewhere in the exhibition, plantlife is entombed, performed, and considered as a volatile resource for economic consumption. Saccharine odes to beauty and ornament are predominantly, and wisely, avoided. Rather, like the reference book of its name, A Curious Herbal approaches its botanical subject matter as a living text that punctures the often staid boundary between science and allegory, injecting a bit of life into nature morte. A Curious Herbal runs January 19–March 3, 2018 at Garden (1345 Kellam Ave., Los Angeles, CA 90026). 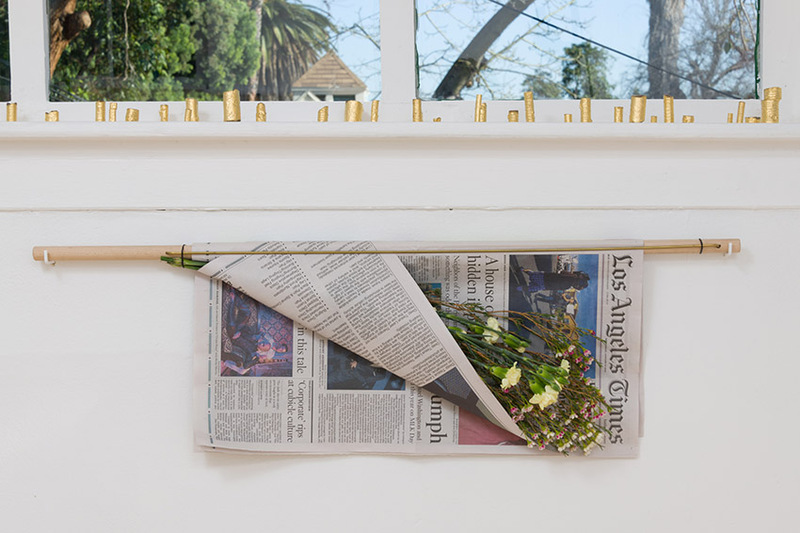 A Curious Herbal (2018) (installation view). Image courtesy of Garden, LA. Dwyer Kilcollin, Tableau (4 holes on bias) (2016). 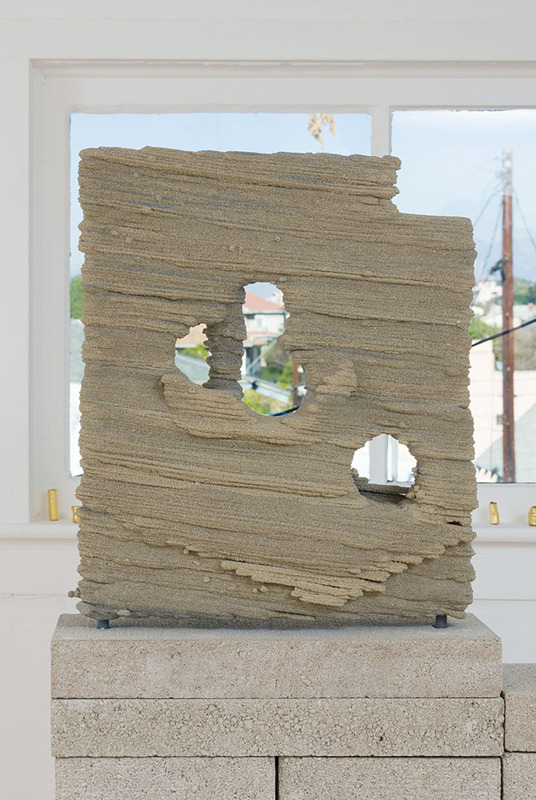 Resin and stone with aluminum and bronze hardware, 19.25 x 15.5 x 5.5 inches. Image courtesy of the artist and Garden, LA. Genevieve Belleveau, performed with Themba Alleyne, Transactional Aesthetics (2018). 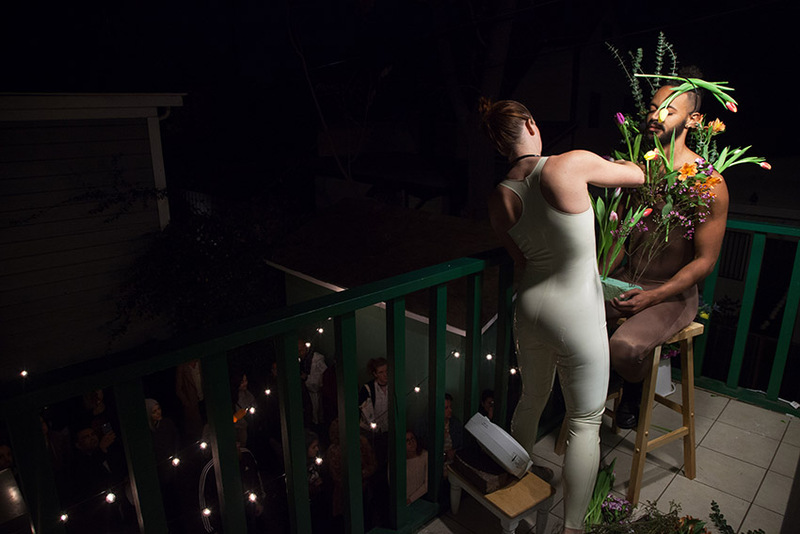 Durational performance with spoken word, harness, and tulips. Image courtesy of the artist and Garden, LA.